Habitat: Rocky hills, outcrops in arid scrub and savanna. Altitudes from 100 to 6,000 feet. Diet in the Wild: Herbivores, feed mostly on grass and fallen fruits. Diet in the Zoo: Fed fruit salad and lettuce. Emerge to eat in early morning hours. Pancake tortoises are small and flat with a thin, flexible shell. The shell is normally 6 to 7 inches long and an inch or so high. On the legs, they have bigger scales with points that project downward and outward. Usually the shell has radiating dark lines on the carapace (upper part of the shell). The plastron (bottom part of shell) is also pale yellow but with dark brown seams and light yellow rays. Juveniles have pale yellow top shells with black seams and yellow rays. Some may have brown spots on their back. The carapace of juveniles is more domed than that of adults. Males can be distinguished from females by their larger and longer tails; However they are smaller than the females and have less distinctive patterns on their shell. Pancake tortoises live in colonies but the colonies are usually isolated from each other. Within one habitat they coexist and many individuals may share the same crevice amicably. Males may fight during the breeding season in January and February. You may need to visit the Herpetarium several times to catch this animal out of its hiding place. 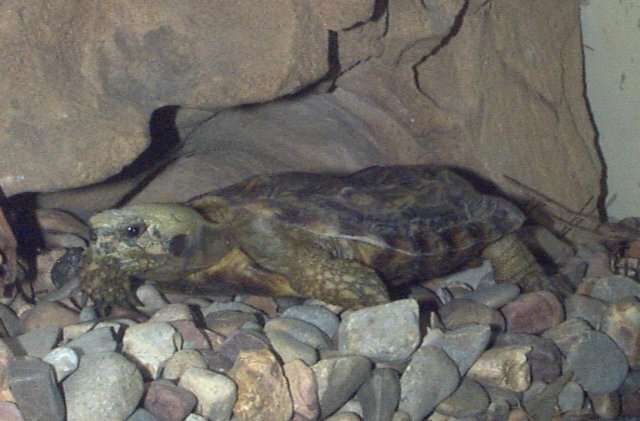 The pancake tortoise is adapted to fitting into tight crevices. Even larger individuals are less than 2 inches high. The shell is so thin and flexible that the plastron moves in and out when the animal breathes. Since the tortoise ould easily be torn apart by predators, it relies on its speed and flexibility to escape from dangerous situations. With the reduced weight of the shell, it can move much more quickly than other species. It was once thought that it could puff its body up with air to wedge itself in place, but this has been found not to be true. Instead, it orients its spiky legs outward so that it is almost impossible to dislodge. Also this animal can also climb vertically. Because they are so light they can turn themselves over with ease if they fall on their backs. In the wild breeding is in January-February with nesting in July-August.They lay eggs that are about two inches long. The eggs can incubated at about 30 degrees Celsius for 140 to 190 days. Combat between males prior to breeding can lead to better reproductive success. In captivity breeding can be any time of the year. Captive animals can live 25 years and perhaps longer. Connor, Michael J. Pancake Tortoise, Malacochersus tornieri. Tortuga Gazette 28(11): 1-3, November 1992. <http://www.tortoise.org/archives/malaco.html>. Kirkpatrick, David T. Ph. D. The Pancake Tortoise. Reptile & Amphibian Magazine, May/June 1993 1-3. <http://www.unc.edu/~dtkirkpa/stuff/pancake.html>. Dr. h.c.Grzimek, Bernhard Grzimek's Animal Life Encyclopedia 6 Reptiles. Van Nostrand Reinhold Company. New York: New York 1975. 101-102. Honolulu Zoo. African Pancake Tortoise. 4 October 2002. <http://www.honoluluzoo.org/african_pancake_tortoise.htm>.